The first in a sweeping science fiction trilogy, "These Broken Stars" is a timeless love story about hope and survival in the face of unthinkable odds. I’ll admit I was a bit hesitant to pick this one up. First of all, it sounded a bit like Titanic: In Space!, (and to be perfectly honest, I wasn’t a fan of how the movie ended. *sniffle*) Secondly, Illuminae was my first exposure to Amie Kaufman’s work (albeit in a different co-author form), and its recycled mishmash of sci-fi tropes sadly didn’t do anything for me. But several friends have spoken well of These Broken Stars, so I finally gave it a go. Told in alternating first-person from the POVs of Tarver and Lilac, the story gives the account of an unlikely pair of starship crash survivors. Lilac’s version is straightforward recall, while Tarver proves more of an unreliable narrator—as he is evidently in the midst of a debriefing, which gradually begins to sound more and more like an interrogation. The style of retelling is particularly effective in that we can be assured of Tarver’s survival and eventual rescue from the get-go… but not of Lilac’s. And there is the increasingly ominous sense that “rescue” is a loose term. While this book does belong in the sci-fi genre, readers should go into it expecting more of a survival story with heavy romantic elements and a dose of mystery. What we do get of the worldbuilding is sensible and well-structured, but the emphasis is on the relational and personal growth obtained over the course of the hero and heroine’s trek across an enigmatic and seemingly uninhabited planet. Disgruntled far-flung colonies, greedy/unethical corporations, recycled Victorian fashion sense, starships named from ironic Greek mythology… Nothing particularly original going on, but for what it is, it's well executed. I loved Tarver like I rarely love a protagonist male. He was believable from the start—believably masculine in thought and action, and believably a soldier in discipline and mindset. We’re given enough background not only to buy his exceptionally young “war hero” status (a fluke of mere survival, by his account), but to also accept why he entered military service in the first place (in misguided honor of his older brother.) He’s exceedingly mature, competent, sarcastic, and unassumingly noble. While I wish readers were privileged to more of the poet side of this warrior, he still came across as satisfyingly complex. Lilac, on the other hand, was a harder sell. You get in the beginning that she’s more than just a pampered rich girl, living under the oppressive shadow of her nearly all-powerful father. But once the story shifts to the crash-landing and the survival/journey theme that makes up the vast majority of the plot, she persists in her wildly impractical ways. (i.e. she stubbornly continues wearing her high-heeled shoes on their day-long hikes through rough terrain until foot injury and infection risk set in, while also insisting on wearing a BALL GOWN even after a suitable jumpsuit alternative is found.) I was patient with her up until this point, where her pride overruled the basics of common sense and pragmatism. I did get pulled out of the story a bit toward the end—which may be the result of an editing oversight. As it’s something of a spoiler, I’m designating it clearly. (view spoiler on Goodreads) Granted, I haven’t seen this bother any other reviewers as of yet. So perhaps it is not as glaring an oversight as my mind registered it. A few qualms aside, I enjoyed the experience. Looking forward to picking up the next book in the series. If sci-fi tends to intimidate you, I’d encourage giving this one a try. Romeo and Juliet take a ride on the Titanic through an episode of Lost in fancy clothes. What I Liked: I'll be the first to admit that I am not a huge fan of space stories, mainly because they make me feel dumb. You start throwing terms like hyperspace and rifts at me, and my brain shuts down. However, there are a few books that have managed to capture my attention and this was one of them. THESE BROKEN STARS is beautifully written story, told from alternating POVs that are woven together seamlessly. Society dictates that Lilac and Tarver can never be together but try as they might, it's obvious that they're attracted to each other. When disaster strikes and they find themselves stranded on a seemingly deserted planet with no real hope of rescue, Lilac and Tarver have to learn to put aside their feelings (sort of) and work together in order to survive. The romance between Lilac and Tarver is the slow burn kind, and even though I thought they should have set aside their differences and gotten to the kissing early, the fact they took their time made it more believable. There are quite a few plot twists and turns and one in particular that almost made me put the book down. And then shortly after left me scratching my head. What Left Me Wanting More: While I was happy with how this ended, I did have a few misgivings. I'm all for stories of great sacrifice but I had a difficult time trying to wrap my brain around that "one" twist. The ending also felt abrupt and I wanted more. And by more, I mean, Tarver. I'm hoping we'll get a glimpse of these characters in the companion books. Final Verdict: Entertaining start to a new space odyssey. A steady, yet captivating plot with an unforgettable romance! 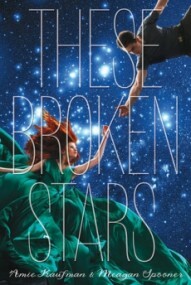 Let me start off by saying that These Broken Stars has one of the prettiest covers I’ve ever seen. That alone attracted me to this book at first. Then I read the synopsis and was intrigued even more. After reading it, I have to say I’m very pleased with this book as a whole. I really liked it. Sure, the pacing was a bit slow, but not in a boring way. I’d describe it as more of a steady read in fact. Kaufman and Spooner wrote a truly captivating and brilliant story with wonderful characters. I think they had just enough detail about this world without it being overkill, although it was a bit touch-and-go for a minute there in the beginning. Once you get through the first third or so of the book, and the characters make the way across this desolate planet, things get really interesting. Even though nothing much happens in the first part, the characters were enough to keep me going, and I’m glad I did. I really loved Tarver. He’s such a good guy and I loved being in his head. I really liked the Lilac and Tarver dynamic, they had some pretty funny scenes. Some trying scenes, that’s for sure, but also some good ones. Lilac is definitely a hard character to like. She’s a rich girl who lives under her father’s rule, and it takes quite awhile before we get true glimpses of her character, in the end, I like where the authors went with her. I liked the build up to their romance, the steady attraction, turned dislike/hate, turned appreciation, turned love thing isn’t something I see often, done well at least, and I think they did a great job with it. One scene in particular gutted me a little bit, I can’t say anything more! The world itself was pretty cool. It did, yet again, take quite awhile for things to unfold and I didn’t get all of the scifi stuff that the authors were trying to convey, but I think it was a great start to an interesting series. I’d say this kind of book would appeal to readers of all types. Yes, it’s more of a scifi read, but it’s got a bit of the paranormal fantasy, a bit of dystopian and action, and a good chunk of romance. At times while reading this I didn’t know what genre it fit into and I think that was part of its charm. I loved that about it. "These Broken Stars" is an interesting YA sci-fi that follows two young people after a space shuttle crash. Lilac LeRoux is practically royalty. Her father owns a high-profile corporation and her life has been sheltered- she is covered in pretty dresses and has lots of nice things, but she knows that her future will be political. Her marriage will only be used to advance her father's company. Tarver is from a poor family and a military veteran. When the space shuttle crashes on a seemingly abandoned planet, they must fight to survive. As they traverse the planet in hopes of rescue, they discover there are more sinister secrets hiding there. The story is told from Lilac and Tarver's point-of-views, along with some conversations between Tarver and someone questioning him about the time after the crash. As they fight for survival and answers, they grow closer to each other and a romance blooms. Partly sci-fi, partly romance, and partly thriller, this book captured my attention from the get-go, and I really loved following Tarver and Lilac's journey. This book will definitely be a hit amongst YA romance fans, and I found it really entertaining and page-turning. I listened to the audiobook, and I highly recommend it- the voices are well done and the telling is fantastic! If you like journey and survival stories with a little romance thrown in, I think you'll like These Broken Stars. I could see this making a really good movie. Love the cover! For the first 70% of this book I was kind of bored, it wasn't a bad book but it was basically a romance on space with some survival stuff and a hint of a possible mystery on the future. But them at 70% some things started happening and the mystery started to unravel and them at 80% I was totally involved on this and was like "wow and wow and wow again". I can totally see from where all the four and five stars ratings came from, this book is definitely good, but for me I never really cared about the characters which is a bummer since the emotional aspects on this book are like really high because of the *things* that happen towards the end. Still I want to continue with this series since the writing was good and my detachment to the characters have more to do with the place I'm right now than a problem of the book. Recommend to: basically people who like romance that are wanting something different or people who like sci-fi/survival stories wanting something heavily focused on romance. Friends, if you like science fiction and romance and this book isn’t already on your Christmas list, please add immediately. It’s GOOD. Describing These Broken Stars is a bit difficult but think of taking Doctor Who, The Titanic, and your favorite YA contemporary romance, putting them all in a huge bottle, and shaking it like there’s no tomorrow. The result of that experiment would be similar to the final outcome of These Broken Stars. I will admit that this book started a little slow for me. At the beginning, we’re introduced to Tarver, the soldier, and Lilac, the high society girl and daughter of the biggest corporation’s front man. Their encounters together do not go well, to say the least. The story starts aboard the Icarus, a luxury spaceship(this is the Titanic part). When the ship is pulled out of hyperspace, Lilac and Tarver are the ones who survive in an utility escape pod and land upon an unknown planet, where they have to survive and attempt to find a way to be rescued. The opening of this book was a little lackluster for me, but once Tarver and Lilac landed on the planet, I was hooked. These Broken Stars has some of the best world-building I’ve ever seen in a science fiction book. World-building in sci-fi can be hit-or-miss for me. It’s generally not a big focus to begin with, to be completely honest, but if it’s too technical I get overwhelmed, and if there’s gaping logic flaws it pulls me out of the story. I loved finding out about Tarver and Lilac’s world though, and I looked forward to it the way I seldom do in stories like this. Hyperspace, flora and fauna growth. . . it’s all my FAVORITE things about the genre. The characters are what make this story for me, though. I LOVE, love romances from two different social classes. I think it might be my favorite trope ever as far as love stories go, and this one was no exception. Even though Lilac begins as the rich girl who has no survival skills and is quite rude to Tarver, I really liked her from the beginning. And the reason for that is even when she was being whiny and cruel, she was determined. She was never the type of character to give up, and I really admired her. And while she might not have been survival-savvy, she proved over and over again she was smart–really intelligent, not just the daughter of an intelligent man. Tarver is your ultimate no-nonsense soldier. I would say that even though at the beginning he’s a much more likable character, he’s also more mysterious. As their journey continued, though, and there were glimpses of Tarver’s past, I really began to feel for his past and what he had been through. The same with Lilac. I LOVED the romance in this because yes, part of it was because they were together with no one else, but through the glimpses of their past I felt I really got to SEE how compatible they were together. It was the perfect slow burn with their back stories being revealed slowly but steadily. Spooner & Kaufman KILL the way they write reveals. Upon first landing on the planet, of course there’s tons of questions about if there’s other life forms and the history of the planet and such. I have to say the way the mystery is built and then slowly revealed just goes to show how good the writing actually is. One of my pet peeves, which I feel happens most often in science fiction, is when authors build up all these mysteries and just hold off plot reveals to build suspense. That works for awhile, but there comes a tipping point where it’s frustrating, not exciting. That never happened here. From about 20% in, I was on the edge of my seat the entire time. And of course, I won’t give anything away, but THAT ENDING!!! This book has one of my favorite endings I’ve read since Parallel(which I declared my favorite ending ever). I’m not sure if These Broken Stars quite lives up to that, but it’s close. I loved how everything came together in the end and the way the story wrapped up. Final Impression: Other than a slow start, this book was flawless. One of my favorite romances, using one of my favorite romantic tropes, really stole the show. Even so, it didn’t make the rest of the book suffer by any means. The world building, the writing, the slow burn, ALL were fabulous. I’m putting a finished copy on my wishlist STAT. These Broken Stars has been on my to read list since January 2012 and when I saw the cover I fell in love with it. That dress, the colors, space and star-crossed lovers! I had to have it and when Disney Hyperion approved me I started reading it that day. The story starts with the first time our heroes meet, where Lilac acts like a snob in order to keep Tarver far away from her life. Lilac's father is the man who created Icarus, the space ship they were traveling. It was the biggest and the best ship ever made, basically fool proof until it wasn't. Lilac and Tarver find themselves on a strange planet where they start hearing voices and seeing things. Before I started reading this book I was expecting to read about star wars, shooting from laser guns and strange aliens. But I got a survival book which happened to be set in the future on another planet. Now, I don't have anything against survival books if they're fast paced but These Broken Stars made me put the book down so many times. If I hadn't got it from the publisher I would've abandon it a long time ago. The first 280 pages were all about them arguing, sleeping, walking, eating their rations and hearing voices. I just felt it was repetitive and didn't have any progress. It didn't have insta-love but it did happen too fast for my taste. Or is it that it bothers me because it started with physical attraction? They were lusting over each other the moment they met and I guess it all depends on the authors execution... If they have what it takes to write a genuine romance, not just shove it in our faces and wait for us to eat it up. The last 100 pages really surprised me. I didn't see some things coming and authors finally found their stride. Story finally started making sense and we were getting answers on some important questions, like what are those voices and what are they after. I only wish the book was shorter or at least the first 280 pages were. I'm well aware my review is showing negative aspects of this novel but I did like it in the end. Hope Kaufman and Spooner give us more action and less sleeping scenes in the sequel.